Brief Synopsis – A college student on vacation in Europe meets a beautiful woman and gets mixed up in a foreign espionage plot. My Take on it – This is a movie that I recall enjoying very much as a kid and loved watching it over and over on cable. They do a great job of merging the genres of a college coming of age film with a spy thriller theme. This movie helped add the word weirgin and the phrase voulez vouz…. (before the song became popular) to my personal lexicon and each of those terms will always remind me of this movie. Anthony Edwards and Linda Fiorentino are great together and as a kid I had such a crush on her in this movie. The thing I love about this film is the fact that because paintball was so prominent in the plot, it helped promote the game itself and even inspired a Gotcha! Game craze on college campuses mirroring the game in the movie. 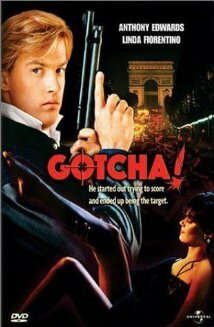 There was a similar themed movie that came out around the same time called TAG: The Assassination Game (1985) that I also enjoyed at the time. I have yet to find a copy in order to rewatch it again.